Meow-Ludo Disco Gamma Meow-Meow with an Opal transit pass. He has a version of the pass implanted in his hand. 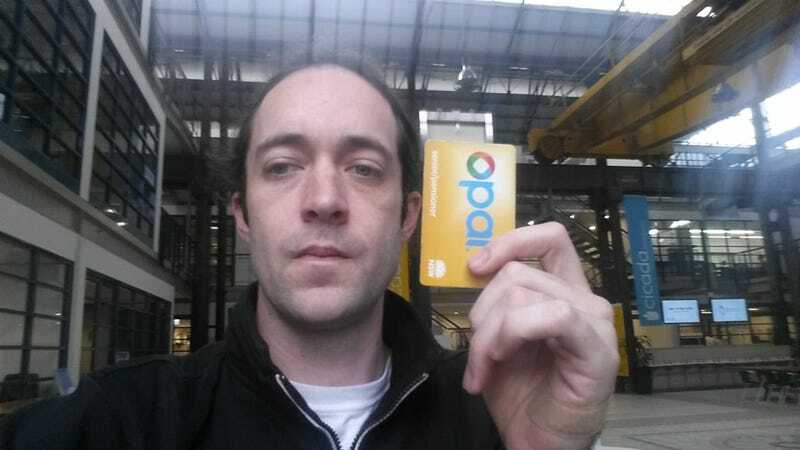 Digging through your purse or pockets every time you enter public transit can be a hassle, so last year Australian biohacker Meow-Ludo Disco Gamma Meow-Meow (yes, that’s his legal name) had a chip from a transit pass implanted in his hand. The chip allowed him to tap on or off of trains in Sydney with a wave of his wrist. That is, until last August, when transit officers handed him fine for traveling without a valid ticket, despite still having $14.07 still left on the chip. On Friday morning in Australia, in an unprecedented legal case, Meow-Meow pled guilty in a local Sydney court to charges of traveling without a valid ticket and failing to produce a ticket for inspection. The battle, though, is likely far from over. At the heart of the case is not just whether one man was within the bounds of the law when he took apart his transit pass and implanted it in his hand, but whether governments have the authority to intervene in the technology we put in our bodies, and how laws will adjust to the rapid expansion of implanted technology. Meow-Meow is a self-described biohacker and cyborg who made headlines in his home country not just for implanting technology into his body, but also for starting the country’s first community bio lab and running for federal election as a candidate from Australia’s science party. Last April, he cut the chip out of his Opal transit pass, encased it in biocompatible plastic, and had a piercer implant it just under the skin of his left hand. A few months after transit inspectors slapped him with a fine, Transport for New South Wales canceled his card. “I respect the magistrates decision, but it wasn’t the outcome I would have liked,” Meow-Meow said. His guilty plea may have been strategic. He told Gizmodo that there will likely be further legal action, but is not yet sure of the next steps that he and his attorney will take. There is a growing movement of people like Meow-Meow interested in augmenting their bodies with technology, but few implants offer the ability to interface with day-to-day life. Magnets, for example, are a popular implant, but mostly amount to a fun party trick. Some people, however, have begun integrating implants into daily life, using NFC and RFID implants that can be programmed to do things like start their car or unlock their front door. Meow-Meow’s case may be the first of a government intervening in the way someone uses implantable technology. But it’s certainly not the first case of a self-identified cyborg being flagged for their machine body parts. Cyborg engineering professor Steve Mann was strip-searched and injured by Canadian airport security more than 15 years ago for his wearable computing system. And in 2013, colorblind artist Neil Harbisson had to lobby the British government to allow him to take his passport photo with the color-sensing antenna he wears affixed to his head. More cases like Meow-Meow’s are likely to follow. The case, said James Hughes of the Institute for Ethics and Emerging Technologies, also brings up interesting issues of ownership and bodily technologies. “This does point in the direction of troubling questions, like if a company or government owns the technology in your body, what rights to it do they have?” Hughes said. Arthur Caplan, a bioethicist at NYU Medical Center, said that the New South Wales government was well within its right to intervene in how Meow-Meow was using his transit pass. Meow-Meow, Caplan said, is unlikely to win his case. What if, he posited, authorities has similarly asked to see his ID but he could not produce it because it was embedded in a chip in his arm? The same logic, Caplan said, applies here. But, he said, the case should also be an indication to the New South Wales government that it may soon have to adjust its infrastructure to accommodate new technologies, just as they did when people began to pay with credit cards.